You look after the skin on your face and body, and you can now look after the skin on your scalp, with Head & Shoulders - the world's number one scalp care range of shampoos and conditioners. Scalp is skin... In the same way that dry, itchy or sensitive facial or body skin needs to be addressed quickly with a moisturiser, a dry, itchy or sensitive scalp needs immediate care too. Leading the way in innovation, Head & Shoulders scientists have devised a set of powerful tools called protein biomarkers to determine the skin's condition. Using these biomarkers, Head & Shoulders scientists are able to assess the state of the scalp skin when it suffers from dandruff and the irritation that goes with it. This deeper understanding of scalp skin has led to an advanced Head & Shoulders formula that gives great anti-dandruff benefits and scalp relief while delivering strong hair care benefits. Key to the formulas is Head & Shoulders' HydraZinc, a power-packed form of ZPT, which effectively reduces dandruff. Keiren Street, Head & Shoulders expert stylist, says, "Shiny, healthy looking hair is the perfect accessory for anyone, and to get great hair it starts with having a healthy scalp. The new Scalp Care collection from Head & Shoulders offers an easy way to have beautiful hair by keeping your scalp balanced." 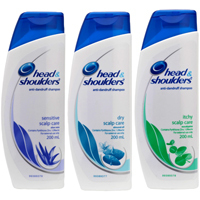 Head & Shoulders is proven to remove more dandruff in one wash verses a non anti-dandruff shampoo. New Head & Shoulders Itchy Scalp Care gives up to 72 hours of itch relief. This gentle yet effective formula that contains eucalyptus, calms and helps normalise the skin's physiological state while effectively reducing visible flakes and thoroughly cleaning your hair to leave it soft and shiny. Contrary to the misconception that anti-dandruff shampoos are drying, the fact is they have to be gentler and more moisturising on scalp skin because it is already irritated. New Head & Shoulders Dry Scalp Care contains nourishing almond oil, and has six times more moisturisers2 meaning your hair and scalp enjoy relief from dryness. New Head & Shoulders Sensitive Scalp Care formula with aloe vera brings you much needed reprieve from scalp skin problems, by thorough yet mild cleansing. It is gentle on your scalp skin and leaves your hair beautifully soft, shiny and looking healthy. Dr Marta Rendon, independent dermatologist and Head & Shoulders consultant, says, "For hair and scalp care, a holistic approach is important in treatment as hair is intrinsically linked to the scalp skin. Hair can only grow and develop to look beautiful when the environment it grows from - the scalp - is in a good state."